« Column: Is Public Education A Charity Case? Ann Arbor District Library board meeting (Dec. 16, 2013): The board’s main action item was to accept the 2012-13 audit, which was briefly reviewed by Dave Fisher of the accounting firm Rehmann. It was a clean report, he said. There was no discussion among board members on that item, though Fisher noted the audit had been discussed at the board’s budget and finance committee in November. Also approved was a one-year lease extension with Green Road Associates for storage of newspaper archives. The library has leased the Plymouth Park facility – an office park owned by First Martin Corp. on Green Road, north of Plymouth – since January 2010. That’s when AADL took possession of the Ann Arbor News archives, a few months after the owners of that publication decided to cease operations. The library is digitizing the Ann Arbor News archives, along with material from other local newspapers, as part of a project called Old News. 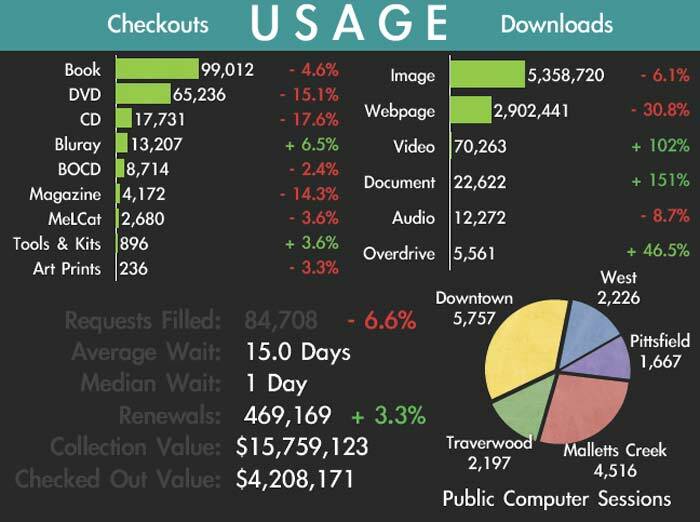 Much of the meeting focused on two staff presentations: A report on library statistics for November in five categories (collections, users, visits, usage and participation); and an update on the Washtenaw Library for the Blind and Physically Disabled (WLBPD). 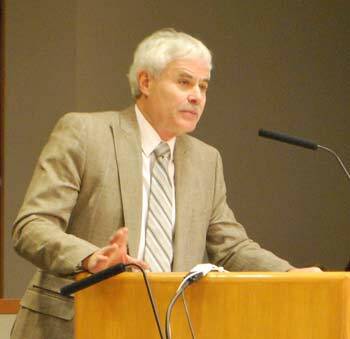 One person, Donald Salberg, addressed the board during public commentary. Part of his remarks focused on the board’s decision – at its Nov. 11, 2013 meeting – to approve a tax-sharing agreement with Pittsfield Township and the State Street corridor improvement authority. He told trustees that they hadn’t identified any real benefit that the CIA would bring to the library. 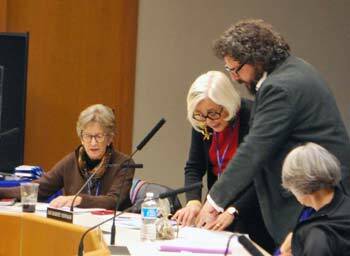 At the end of the meeting, board president Prue Rosenthal read a statement that defended the board’s decision to participate in the CIA, outlining its benefits to the library and the broader community. She said that although the board vote had not been unanimous, she thought that all trustees were comfortable that the decision was made with a great deal of care. Dave Fisher of Rehmann gave a report to the board. He noted that he had reviewed the audit in detail at the board’s budget and finance committee meeting on Nov. 12. [Members of that committee are Nancy Kaplan, Barbara Murphy, and Jan Barney Newman.] He told the board that he planned to hit just the highlights. From left: Prue Rosenthal, Jan Barney Newman, Eli Neiburger and Nancy Kaplan. Rosenthal is AADL board president. Newman and Kaplan serve on the board’s budget and finance committee. Neiburger is AADL’s associate director of IT and product development. The audit reflects a clean report on AADL’s financial statements, Fisher said. That’s very good, he added, and it’s the same opinion that the library has received in recent years. The audit covered AADL’s fiscal year from July 1, 2012 through June 30, 2013. Total general fund revenues for the year were $12.055 million – compared to $11.943 million the previous year. About 92% of those revenues ($11.105 million) came from real and personal property taxes that were levied in the AADL district. Total expenditures for the year were $11.967 million. That left a surplus of $87,446. Compared to the budgeted amounts of revenues and expenditures, AADL recorded a favorable variance of $97,446, he said. Out of the library’s $8.191 million in combined fund balances, $7.7 million is unassigned and available for spending at the library’s discretion. That amount equates to about 64% of general fund expenditures – representing several months of operating expenses. The library is on very solid financial ground, Fisher said. Unlike many libraries, AADL has no long-term debt, he noted, so the library doesn’t have to budget for principal and interest payments on loans. The library has $4.637 million in investments. Bank deposits (checking, savings and certificates of deposit) totaled $3.696 million. AADL’s total net position is $30.445 million. Fisher mentioned a couple of internal control enhancements that are recommended, including documentation for the review of AADL’s check register. The review is already being done, he noted, so it’s just a matter of documenting that process and indicating that it’s been done. The other recommendation is to periodically change the passwords for access to financial software, for security purposes. There were no substantive questions for Fisher from the board. Margaret Leary asked director Josie Parker whether the audit would be posted on the AADL website. Parker replied that it would be. Outcome: The board unanimously voted to accept the 2012-13 audit. Through November, the library has received 96.2% of its budgeted tax receipts. The library had $14.338 million in unrestricted cash at the end of November, with a fund balance of $8.121 million. Five expense items are currently over budget, Nieman reported, but all of those items are expected to come back in line with budgeted amounts by the end of the fiscal year, which ends on June 30, 2014. The over-budget line items are: (1) purchased services; (2) communications, for an annual Internet-related payment; (3) software; (4) copier/maintenance expense; and (5) supplies, due to a large purchase of computer supplies in November. Other November highlights included receipt of a $40,000 donation from the Friends of the AADL. Other than that, there was nothing out of the ordinary during the month, he concluded. Prue Rosenthal thanked the Friends for their donation. Barbara Murphy wondered about the impact of foreclosed properties that had been sold through a recent tax auction held by the Washtenaw County treasurer’s office. The total sale proceeds had been about $400,000 less than the treasurer had expected, Murphy said, and that shortfall would affect the local taxing authorities. She asked Nieman whether it would affect AADL. Nieman replied that the impact depends on where the foreclosed properties are located. Only the properties that are located in the AADL district would impact the library. He did not have any additional information. The board was asked to approve a one-year lease extension with Green Road Associates for storage of newspaper archives. The annual rate of $38,500 is for a period beginning Jan. 1, 2014. The library’s original lease was for a two-year period at $38,000 annually. In November 2011, the board approved a one-year extension, also at the $38,000 annual rate. No extension was brought to the board for approval in 2012. There was no discussion on this item. Outcome: The board unanimously voted to approve a one-year lease extension with Green Road Associates. Eli Neiburger – AADL’s associate director of IT and product development – gave a presentation on library statistics, providing details in five categories for the month of November: collections, users, visits, usage and participation. The data is compared to year-ago figures, when available. AADL November 2013 collections data. 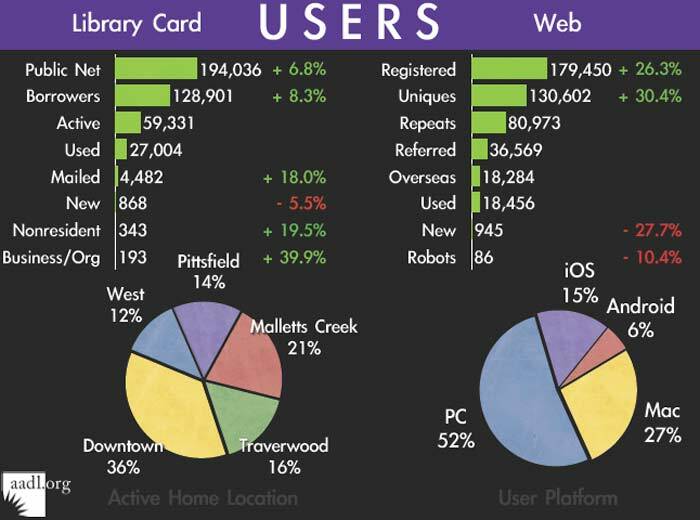 AADL November 2013 data on library users. 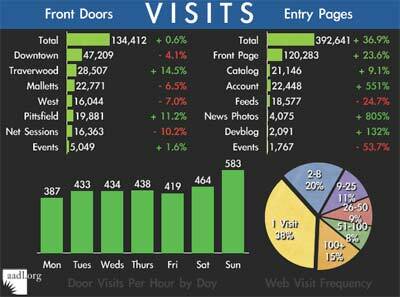 AADL November 2013 data on visits. AADL November 2013 usage data. 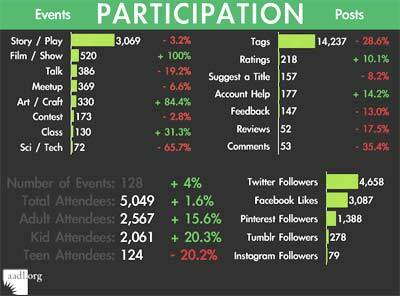 AADL November 2013 data on participation. During his 30-minute presentation, Neiburger reviewed highlights from the November data, interspersed with queries from board members. In addition to statistics in the five categories that he’s been presenting over the past few months, Neiburger included information on AADL’s social media. AADL director Josie Parker covered several items in her Dec. 16 report. She noted that the building’s lower-level exhibit cases were displaying an exhibit of children’s books with culinary themes. The exhibit was curated by JJ Jacobson, who was the curator for the culinary collection at the University of Michigan’s Clements Library. That culinary collection is now part of the UM Special Collections Library, she said. Before the board meeting, Parker said she’d been down at the exhibit with several UM librarians and curators, as well as Jan Longone, who donated her culinary collection to UM. 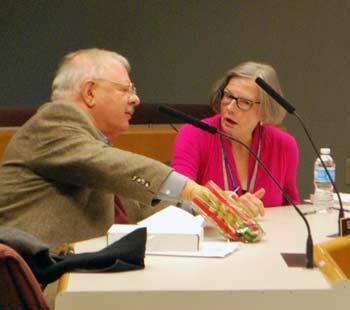 AADL director Josie Parker, right, talks with Donald Harrison and Onna Solomon before the start of the Dec. 16, 2013 library board meeting. 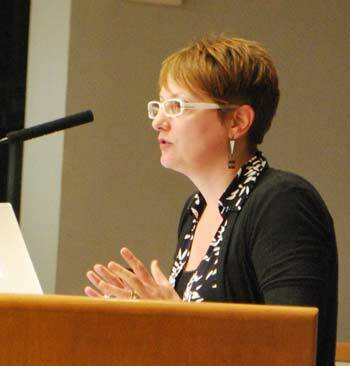 Parker said that the collaboration with UM started when she first became AADL director. She’d talked with Bill Gosling, who at the time was the UM librarian, about how to bring the university’s collection into the public library so that it could reach more people. She said that because of her own graduate work at UM as well as Gosling’s interest in children’s literature and pop-up books, she had suggested starting with the children’s literature collection. Every year there has been a curated exhibit of UM holdings at AADL, to mark children’s book week, which is in November. Parker then told a story related to the weekly reading she does for kindergarten classes at Angell Elementary School, as part of an Ann Arbor Rotary program. Earlier in the day, a little girl from one of the classes had visited Parker at her office, brought by the girl’s father. At the most recent reading, the children had talked about elves. So when the girl visited her, Parker showed her the next book she planned to read to the class: “The Blueberry Pie Elf.” The girl’s father then revealed that it had been his favorite book when he was his daughter’s age. Parker said she’d told that story to the current exhibit’s curator, because it related to the exhibit’s focus on culinary-themed children’s literature. Parker said she thought the board would enjoy the anecdote, too. Parker also highlighted an article that had been provided to the board, written by Ira Lax for the Music Education Association’s publication about the AADL’s Library Songsters program. Parker said she was proud of Lax for continuing to find teachers who are interested in having him and a musician come to a class, at the library’s expense, to write songs with students that teach about history. The students then come to the library to perform the song. Parker’s report also included an update on collaboration with Washtenaw Literacy. The library currently hosts Washtenaw Literacy’s English as a Second Language (ESL) classes at its Pittsfield and Traverwood branches two days each week. Washtenaw Literacy asked for an additional day to hold classes at Traverwood, and AADL agreed, Parker reported. In her final item, Parker updated the board on her work as a commissioner with the state Commission for Blind Persons. Parker and six others had been appointed in October 2012 by Gov. Rick Snyder, who had abolished the previous commission and reorganized the department that provides services to the blind. The current organization is the Bureau of Services for Blind Persons, which is part of the state’s Dept. of Licensing and Regulatory Affairs. The commission’s charge had been to visit all the offices of the bureau and talk with consumers and staff, and to make recommendations to the governor. Parker serves on the commission’s subcommittee on consumer services. She noted that a report will be submitted to the governor with a list of recommendations next year. It will be leading up to AADL’s fifth anniversary for administering the Washtenaw Library for the Blind and Physically Disabled, she noted, which will be marked by an exhibit on Helen Keller at the downtown library in May 2014. In response to a query from a board member, Parker noted that four of the seven commissioners are legally blind, but all of the other commissioners wear glasses. Terry Soave, AADL’s manager of outreach and neighborhood services, gave the board an update on the Washtenaw Library for the Blind and Physically Disabled (WLBPD). Terry Soave, AADL’s manager of outreach and neighborhood services, gave the board an update on the Washtenaw Library for the Blind and Physically Disabled. 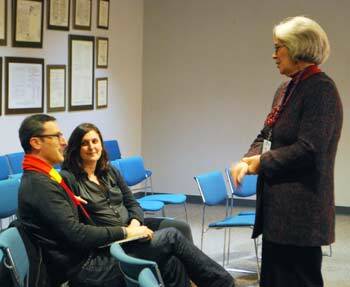 In introducing Soave’s presentation, AADL director Josie Parker told the board that earlier in the month, the AADL had hosted the directors of libraries from Manchester, Saline, Chelsea, Pinckney, Brighton, South Lyon and Ypsilanti. The focus was on the services that AADL provides through the WLBPD, and how other libraries can promote those services to their patrons. Parker asked Soave to give the same presentation to the board. The WLBPD loans books, magazines and videos in various formats – including digital cartridge, digital download, large print, Braille, and descriptive video – to residents of Washtenaw County who are certified as unable to read or use standard printed materials as a result of temporary or permanent visual or physical limitations. A “talking book” machine and materials are mailed at no cost to individual patrons who qualify. The WLBPD also provides access to download over 50,000 books and dozens of magazines via the National Library Service’s Braille and Audio Reading Download (BARD) site. Although WLBPD is located in the lower level of the downtown library, services are available at all branches, Soave said. Anyone who eligible for WLBPD services – along with anyone living in the same household – is also eligible for general AADL borrowing privileges, even if they live outside of AADL’s district. Soave noted that WLBPD is a sub-regional library for the National Library Service (NLS), which is a department of the Library of Congress. The NLS controls the collection in terms of selecting acquisitions. It also provides equipment and oversees standards that all libraries in the network must meet. In order to provide services at all branches, AADL staff were trained at every location, Soave said. The biggest challenge was training in the automation system. To help with that and other training, some of the AADL staff created a Wiki page with step-by-step instructions, Soave said. The model of training all staff, rather than having a dedicated department to handle services for the blind and physically disabled, has been successful and unusual, she said. AADL is probably the only library in the country that’s doing it this way, Soave added. So in May of 2013, AADL staff also launched a national Wiki for the network of libraries for the blind and physically handicapped. Parker noted that because of this work, AADL has been officially recognized by other library organizations. Blind: Visual acuity of 20/200 or less in the better eye with correcting glasses or the widest diameter of visual field subtending an angular distance no greater than 20 degrees. Deaf-Blind: Severe auditory impairment in combination with legal blindness. Visually Disabled: Lacks visual acuity to read standard printed materials without aids or devices other than regular glasses. Physically Disabled: Unable to read or use standard printed materials as a result of physical limitations. Examples include: without arms of the use of arms; impaired or weakened muscle and nerve control; limitations resulting from strokes, cerebral palsy, multiple sclerosis, muscular dystrophy, polio, arthritis. Reading Disabled: Organic dysfunction of sufficient severity to prevent reading printed materials in a normal manner (this disability requires the signature of a medical or osteopathic doctor as certifying authority). Soave brought examples of digital machines and other equipment that WLBPD patrons receive. She noted that the national goal to get people signed up for the Braille and Audio Reading Download service, known as BARD, is 10% of eligible patrons. The WLBPD is currently at 29%. AADL trustees Ed Surovell and Margaret Leary. The AADL doesn’t house a collection of Braille material, but has access to the collection from the regional library in Lansing, or items can be ordered from the National Library Service. Other materials include “described” videos – movies in which visual elements, like scenes and costumes, are described with voiceovers. For its large print books-by-mail service, Parker noted that AADL worked out a deal with the post office so that the books can be mailed as “free matter” – at no cost to the library or the patron. In terms of outreach, Soave reported that WLBPD puts out a quarterly newsletter that’s produced by AADL’s community relations and marketing staff. The newsletters are posted online, and are available in audio and text-only versions. The WLBPD is required by the NLS to do a patron satisfaction survey every three years. Its first one was in 2012, with a 37% response rate. Of respondents, over 95% indicated that they would recommend the WLBPD services to others, Soave said. The NLS also conducts a site review every two years. Results from the survey and site reviews are posted online. Originally the WLBPD had targeted eligible patrons, but last year the staff decided to take the additional step of reaching out to readers who wouldn’t be eligible but who would benefit from some of WLBPD services and materials, like the large print book collection. They developed stickers that are placed in every large print book in AADL’s collection. The stickers were also provided to other library systems within the county to put in their large print collection. Ypsilanti District Library, for example, has over 10,000 items in its large print collection. The average age of a WLBPD patron is 80, Soave said, so natural attrition on the list of patrons is a big challenge. The director of the NLS has challenged all libraries for the blind and physically disabled to increase the number of patrons by 20%. In 2010, there were only seven libraries nationwide that showed any increase at all, Soave said. Since putting the stickers in books, WLBPD has shown a 12% increase. Soave noted that WLBPD has been recognized twice by NLS for best practices in outreach. Margaret Leary, noting that she is a former librarian [she retired as director of the University of Michigan Law Library], pointed out that typically organizations will have specialists who are trained to provide services in one area. But when all staff members are trained, then patrons never have to wait for services if someone is on vacation or away from the desk. Leary praised Soave and the whole AADL staff for pushing this model of integrated training, saying that it hugely enhanced services to the blind and physically disabled. When the WLBPD was managed by the county, it was located in a small building that wasn’t open very often, Leary noted. Leary said she appreciated Soave’s presentation, because it was about a service that she personally doesn’t need – so she had been unfamiliar with the details of WLBPD. “It’s an example of the iceberg that’s beneath the tip that we see so often in these meetings,” she said. From left: Barbara Murphy and Rebecca Head. Barbara Murphy asked how AADL can make people aware of WLBPD, even if they don’t need it, so that they can tell people they know. Soave noted that staff of the outreach department goes out into neighborhoods talking about AADL services, including WLBPD. Parker added that local ophthalmology offices are also aware of WLBPD, as is the University of Michigan’s Kellogg Eye Center. She said it’s like any of AADL’s programs and services – if you don’t need it or use it, it’s not on your radar. In response to a query from Ed Surovell, Parker said there’s no other service that’s comparable to WLBPD locally, or to the network of the National Library Service. She noted that when Washtenaw County was having budget problems several years ago, county administrator Bob Guenzel asked if AADL would help. At the time, Washtenaw County’s program served several counties, but AADL agreed to serve just Washtenaw County, Parker said. However, no one goes unserved, she added. The other counties are served now by the state library, and the level of service is different. Parker noted that the decision to incorporate WLBPD into the overall AADL services – and not to have a “library within a library” – had been controversial when they first took on the project. But five years later, they can show a positive outcome. Rebecca Head praised Soave, saying that the AADL has shown what outreach and communication can do to promote what the library has to offer. That’s critical, she added, because people are so busy and don’t always have the time to find out about the AADL programs and services that are available. The board has six committees: communications, budget and finance, facilities, policy, director’s evaluation, and executive. 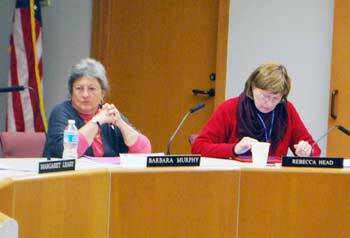 Two brief committee reports were made during the Dec. 16 board meeting. Nancy Kaplan reported that the board’s budget and finance committee met with Dave Fischer of the accounting firm Rehmann to review the audit. Committee members were very pleased that it was an excellent report, she said. The board was asked to pass resolutions of thanks for two employees who are retiring at the end of 2013. Sharon Iverson has worked for AADL since mid-2004. Betsy Baier started working for AADL in February of 1975. AADL director Josie Parker noted that Baier is a children’s librarian who was instrumental in developing the preschool storytime program. Within the last few years, she’s been responsible for the acquisition of children’s material in all formats. Parker invited board members to a reception held later that week for Baier. Parker reported that Iverson is a teen librarian, who came to AADL after serving as a public school librarian. She primarily worked at the Malletts Creek branch. Outcome: Both resolutions were passed unanimously. Donald Salberg began by wishing the board members a merry Christmas and happy new year. He hoped that when they next met in 2014, they’d have some new resolutions for dealing with library issues. He hoped they would revisit the accessibility and safety issues for disabled people at the downtown library. His understanding was that library officials met with people who were familiar with ADA standards prior to the November 2012 referendum on bonding for a new downtown library. He said he understood why any changes to be made would have been postponed until after that vote, since a new building would have made renovation unnecessary. However, the referendum did not pass, he noted, and there are recommendations for improvements – especially for the front entrance, where there are certain risks along the ramp leading up to the front door, he said. Also, bathrooms could be improved and there are other minor changes that would help the disabled move around with more ease. Salberg also noted that the Saline District Library and the Washtenaw Community College have opted out of Pittsfield Township’s State Street corridor improvement authority. He said that officials from both entities had indicated that taxpayers had not voted for a millage to be spent on street construction, and they preferred to have the tax revenues spent for the originally-intended purposes. There’s hope, he said, that if enough taxing authorities don’t join the CIA, then the project won’t be initiated, he said, and that the AADL then wouldn’t lose the tax revenues that it will lose if the CIA moves ahead. He said the AADL board hadn’t identified any real benefit that the CIA would bring for the library. “It appears that the biggest benefit will be to the real estate industry,” Salberg added, because purportedly 40% of properties along the State Street development area are undeveloped. Property will appreciate because of the road improvements, Salberg said, so the real benefit will be to the people who sell, develop or manage those properties. In the future, he concluded, it would be helpful for the AADL board to get input from the community before making a decision on how to spend the community’s money. The board’s fiduciary responsibility requires that they make decisions that serve the public the best, Rosenthal said. Sometimes, those decisions affect tax revenues – as is the case with the CIA, she noted. State law gives the board the power to opt-out of a corridor improvement authority, but the board’s duty is to consider all relevant elements and make the best decision for the library. The amount of money was relatively small, she pointed out, and the project would improve access to AADL’s Pittsfield branch. If the CIA goes forward, it would increase the library’s tax base, she added. And if the project doesn’t move forward, AADL will be held harmless. A publicly funded road is more equitable than requiring property owners to do it themselves, Rosenthal said. “We believe in being a good neighbor to Pittsfield,” she said, which has helped AADL considerably when the library branch was built in the township. She noted that only 50% of the tax increment increase will be captured by the CIA, and that the township worked with AADL to negotiate terms of the agreement. Rosenthal said the AADL cares about the environment and sustainability, and this project will improve pedestrian and non-motorized transportation between Pittsfield Township and Ann Arbor, and will enable better public transportation to reduce the use of cars and improve air quality. It will provide better stormwater management to protect the watershed, she said. Although the board vote was not unanimous, Rosenthal concluded, she thought that all trustees were comfortable that the decision was made with a great deal of care. Ed Surovell responded directly to Salberg’s commentary. He noted that if the value of the land adjacent to the road improvement is increased, then any of that land that’s within the AADL district will provide increased tax revenues to the library. That’s a direct benefit to AADL, Surovell said. Present: Rebecca Head, Nancy Kaplan, Margaret Leary, Barbara Murphy, Jan Barney Newman, Prue Rosenthal, Ed Surovell. Also AADL director Josie Parker. The Chronicle relies in part on regular voluntary subscriptions to support our coverage of public bodies like the Ann Arbor District Library board. Check out this link for details: Subscribe to The Chronicle. And if you’re already supporting us, please encourage your friends, neighbors and colleagues to help support The Chronicle, too!